Clinical exercise sessions are a total body-conditioning program involving exercises that improve your posture, strength, flexibility, balance and co-ordination. The different pieces of equipment Reformer, Cadillac (Trapeze Table) Stability Chair, Spine Corrector and Ladder Barrel together with the Mat and Small equipment allow the body to be exercised in a number of different ways. By assisting or resisting movement in single or multi-directional patterns we can re-educate postural awareness and develop a muscular core or centre with co-ordinated upper and lower body muscles that are both flexible and strong. Our Physiotherapists are skilled in a clinical approach as an ideal way to rehabilitate clients from injury to normal function and will tailor your program needs at each session. Sports Focus Physiotherapy are available to cater to all your physio needs. 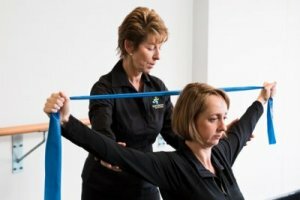 Contact us today to find out more about clinical Pilates Sydney.